Naples was founded by the Greeks in the 8th century BC, following the Second Greek colonization. On the other hand, the myth tells the Greek Parthenope (from the Greek “virgin“) as the founder of our city. There are a lot of myths on Parthenope, but they have only one thing in common: Naples was founded with love and for love. So, we can surely say that love and passion are the foundation of our city. Shown below, 3 different stories of the Parthenope’s myth. Parthenope was a mermaid who lived among the rocks in the middle of the sea. One day, Ulysses came to the place where the mermaids lived. The myth tells that Partenope tried to seduce the hero with her beautiful singing, but she failed. The memaid Parthenope never accepted the rejection and she killed herself in the sea. The waves carried her body to the gulf of Naples, precisely on the little island of Megaride. 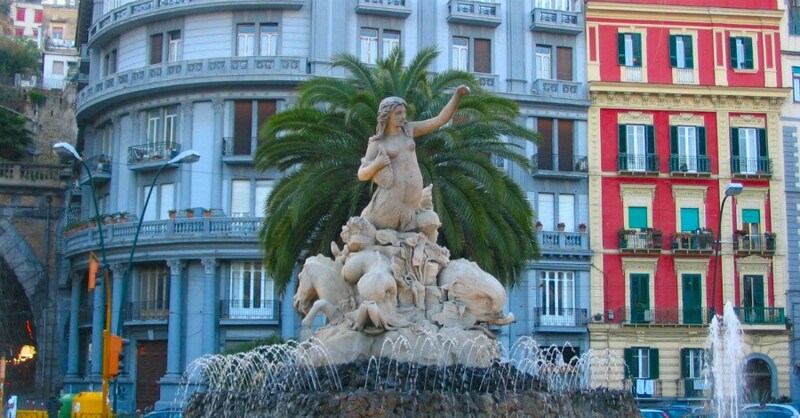 Here, Pathenope’s body dissolved, taking shape in the city of Naples: her head is the hill of Capodimonte and her tail lays along the hill of Posillipo. Matilde Serao was a Neapolitan writer of 20th Century. She wrote her interpretation of the Partenope’s myth. Parthenope, a Greek girl, was in love with Athenian hero Cimone. Unfortunately, Parthenope’s father proudly married his daughter to another man. For this reason, the 2 lovers ran away from Greece, and they approached right in the Gulf of Naples. In this way, Parthenope and Cimone could live their love without any problems. Then, the 2 lovers were reached by their families, beginning to populate the city. Parthenopegave birth to 12 children, becoming the mother of the Neapolitan people, to whom everyone turns. Moreover, according to Matilde Serao, Partenope never died, but she still alive to stay with her people. In the 1800’s there was another variant of the Parthenope myth. It was told that Parthenopewas a mermaid who lived in the shores of the Gulf of Naples. One time, a centaur- called Vesuvio– met the young memaid. So, the god of love Eros threw a dart and he made the two young men fall in love. Vesuvio e Parthenope were very very happy to share their love. But, Zeus– who loved Parthenope- decided to separate the two loved forever. So, the powerful Zeus turned Vesuvio into a volcano at the edge of the gulf, in this way the mermaid could always see him far away. But, Parthenope didn’t live without her beloved: for this reason, she killed herself. The waves dragged her body to the coast of the island of Megaride and she assumed the shape of a lovely city.